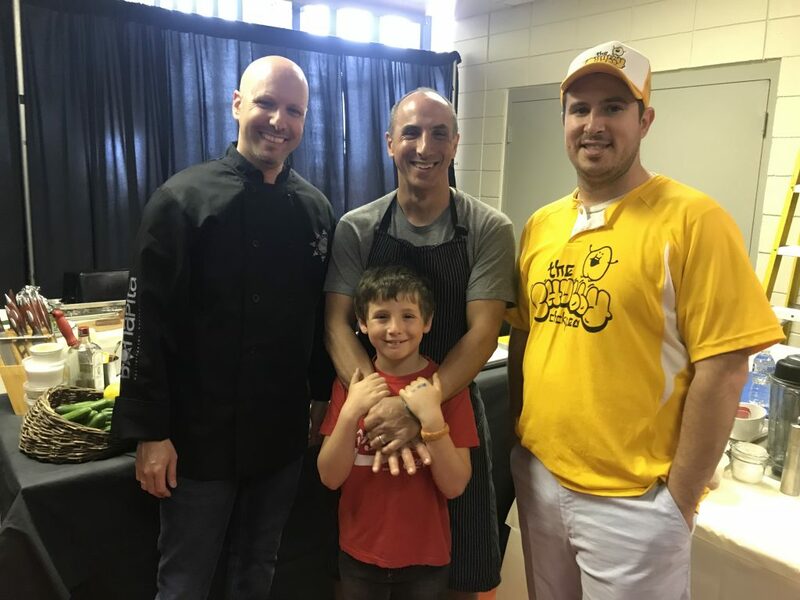 JArts brought some extra flavor to the community-wide Celebrate Israel day this year with cooking demos by local favorite chefs Michael Leviton (formerly of Area Four and Lumiere), Ilan Barniv (Bonapita), and Avi Shemotov (The Chubby Chickpea). 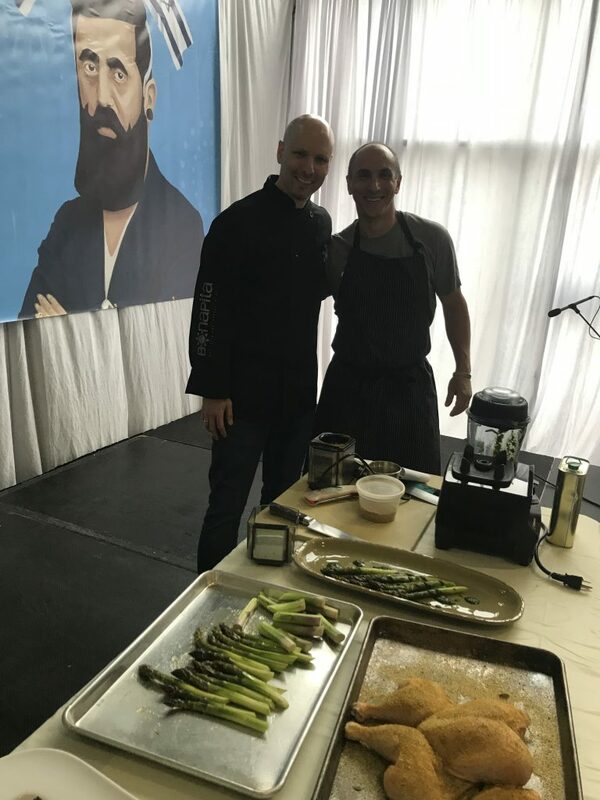 Inspired by the JArts/IAC culinary tour of Israel earlier this year, Michael Leviton created a mouthwatering Hawajj Chicken with asparagus and schug (homemade hot sauce). See his simple recipe below, and enjoy! Click here for a Facebook live video of Ilan Barniv preparing cold smoked salmon, and some simple beautiful appetizers with it. 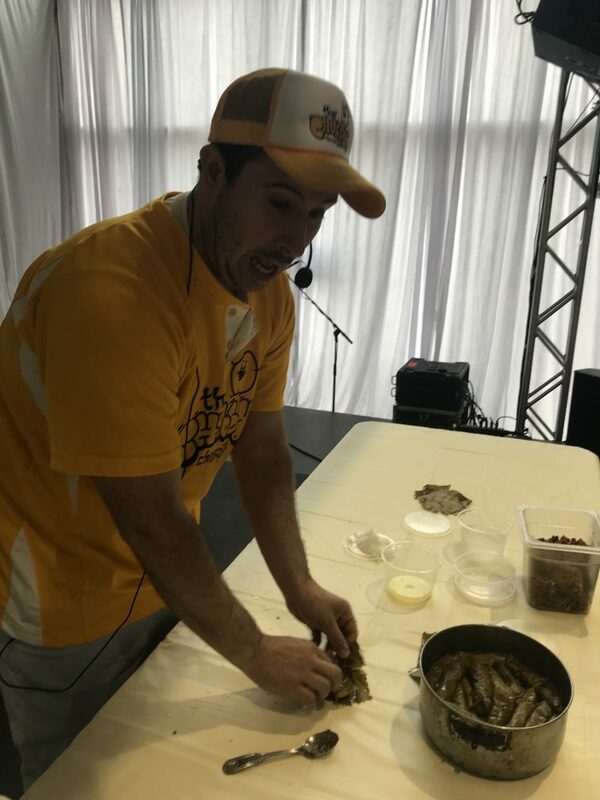 Avi Shemtov taught us the secrets of making stuffed grape leaves – and while we don’t have the recipe yet, the secret is stuffing the rolls tightly into the pot so that they don’t fall apart! Lightly toast the cumin, coriander and cardamom. When the spices are cool, combine with the peppercorns and saffron and grind (finely) in a spice grinder. Then add the turmeric and mix well. Lightly toast the cumin, coriander and cardamom. Combine with the peppercorns and grind finely in a spice grinder. Transfer all of the ingredients to a blender and blend until very smooth. Cut the bottoms of the asparagus spears, so the spears are about five or six inches long. Alternatively, snap the bottoms off at their natural break point. Toss the spears with the olive oil and season with salt and freshly ground pepper. Place the spears on a parchment paper lined sheet pan, and roast for 7 minutes. Remove from the oven and let cool to room temperature. May be refrigerated overnight. Ideally, season the bird generously (top and bottom) with the hawajj salt 24 hours in advance of cooking, leaving it (uncovered) on a rack on a sheet pan in the refrigerator. If that’s not possible, the seasoning can be done the same day right before cooking. Pre-heat the broiler (high setting if your oven allows). Place an oven rack about 6 inches from the broiler, and put your bird (already on its rack and sheet pan) on the rack. Broil for about 5 minutes and then rotate the pan 180 degrees and broil another 5 minutes or so. You are looking for a nice mix of toasted and charred. Depending upon your broiler and the distance from the broiler this may take less than, or significantly more that 10 minutes. Please pay attention. Once the bird is nicely brown and crispy, remove the bird form the oven and let it rest for about 10 minutes. Meanwhile, reduce the heat in the oven to 170 degrees (Fahrenheit) and then, once the bird is rested, return the chicken to the oven (legs pointing to the front of the oven, breast in the back) and cook for 75-90 minutes, or until a thermometer registers 165 degrees in the breast. Let the bird rest about 5-10 minutes and enjoy!